Under the direction of United States Coast Guard Licensed Masters Elizabeth Shanahan and Eugenie Russell, our experienced team of marine professionals offer dedicated and personalized service, no matter the size or type of assignment. We have carefully and successfully captained sailing and motor yachts up and down the West Coast, including Mexico and Alaska. We also serve the East Coast, South America through the Caribbean, the Eastern Seaboard, through the Erie Canal, to the Great lakes and St. Lawrence Seaway, the South Pacific , Europe, and the Mediterranean. Our captains are available from 100T to unlimited, sailing and motor yachts as well as power boats. Elizabeth is an expert captain, and yacht manager. She can deliver motor yachts, sailboats and powerboats around the world. She is a fully licensed Master, 500 Ton, with sail and auxiliary towing endorsements; she is also a marine surveyor and project manager. Elizabeth has more than 30 years of experience in the open ocean. She started sailing in Newport Beach, CA when she was seven years old and progressed up to bigger sailboats from there. When Elizabeth was fifteen years old, she was hired as the deckhand on a Grand Banks 48-foot luxury yacht, the Elbee II. Within a month, she was running the boat. This was the beginning of Elizabeth's lifelong love for living and working on the water. While living at the Balboa Bay Club and working for The Crow's Nest Yacht Brokerage, she started her first yacht company, Elizabeth's Yacht Service, doing routine maintenance on boats and also working for yacht owners. Elizabeth has had a boat of her own since then, and has been actively delivering boats since 2004. She has done deliveries as long as 3500 miles and over 50 days, and is insurable for deliveries during the hurricane season in Mexico, the Caribbean, and South Pacific. She has extensive experience providing total yacht management, including crew, outfitting, maintenance, scheduling, navigation, route planning, and accounting. She is fluent in English, Spanish and basic Italian. Eugenie is a fully licensed 100T captain, as well as an ASA and US Sailing coastal cruising certification instructor. A sailor, teacher and entrepreneur, she has been sailing for more than thirty years. Being pushed into breaking waves in an Optimist at the age of seven might seem like a rough introduction to sailing to some, but to Eugenie, it was the beginning of a long and exciting career on the water. Eugenie raced, crewed, delivered and moved yachts and sailboats throughout high school and college. The day she graduated from college, she embarked on her professional boating career, sailing and skippering sloops, ketches, Oysters and a Nautor Swan 68 through locations around the world. Eugenie then moved to San Francisco, where she focused both on running boats and teaching sailing skills. She has run four sailing schools—the Spinnaker Sailing School in San Francisco, the City of Oakland's youth sailing program, the J World Sailing School program Currently in Puerto Vallarta, and the Vallarta Yacht Club Junior Sailing Program. Eugenie operated private charters, provided sailing instruction, did deliveries, and captained boats while she ran the programs above. She also founded the company J Concierge, a support team for J/Boat owners. Today, in addition to delivering boats worldwide, Eugenie teaches sailing and yachting to anyone who has the desire to let the dock lines go. She is the coach for the Vallarta Yacht Club's Junior Sailing Program, where she is training todays youth to compete in Olympic-level competitions. She speaks French, Spanish and English, and is dedicated to making students understand and love sailing. Eugenie was credited for her heroic efforts in the safe rescue of her guests and students after the J-120 she was skippering collided with a whale in the 2009. Sergio has been with E2 Yacht services for 6 years. He came to Vallarta 20 years ago in pursuit of his desire to be in the maritime industry. He started as a deck hand on a sailing catamaran doing day charters , taking care of guests and general boat work. Moving up from there to a private sport fisher as the mate and engineer and participated in numerous fishing tournaments including the Bisbee and the Black and Blue in Cabo San Lucas. Progressively moving up the ladder in credentialing here in Mexico, After having children he came to work on land but stayed in the marine business working at the local shipyard, doing maintenance, system upgrades, painting increasing his knowledge and skills. After working at the ship yard he spent the next 4 years as the assistant to the local marine diesel mechanic, doing all types of mechanical work from oil changes to complete engine rebuilds. He joined E2 yacht services in 2008. He handles most maintenance work and is also a mate/engineer on delivery trips and as captain on Yachts from 32’ to 65’ . He enjoys the diversity that he has with E2 yacht services. Israel Avila Moreles came to Vallarta in 2000 and has progressively improved his career. 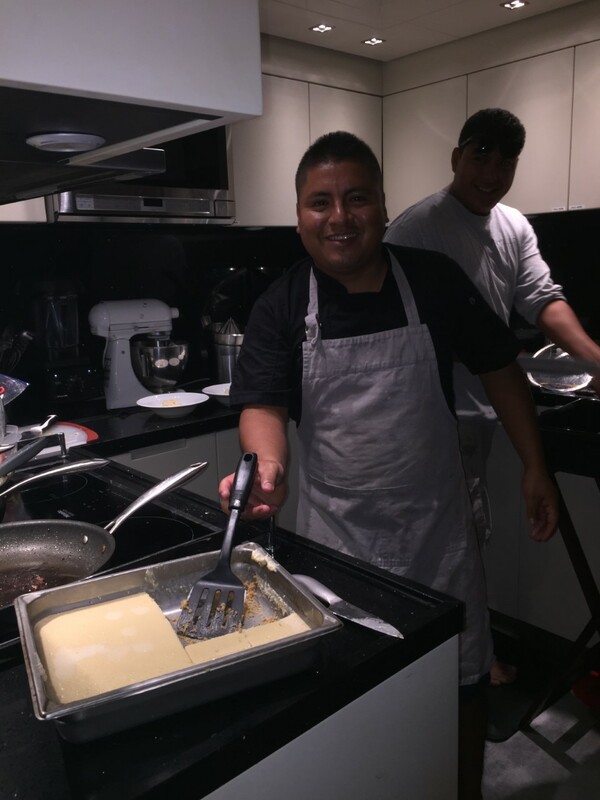 He started working in local restaurants such as the Blue Shrimp and Boca Vento, until he landed at the Vallarta yacht club in 2005 where he started as sous chef and eventually worked his way up to executive chef. Mauricio Martinez Juarez started working for E2 yacht in 2014, He started and a boat washer and maintance guy, and has moved up to get his libreta de mar and his passport. He has done numerous deliveries to Ensenada on vessels such as a Viking Princess 65’ and a 45’ Manta Catamaran. After finishing his studying in fishery ( Aqua Cultura) he started his career in 2004 doing general boat maintenance and as working as a mariner on the Vessel Castor, a 50’ motor yacht located in Marina Nuevo Vallarta. After having worked there for several years, he decided to go out on his own, doing boat maintenance, including washing, waxing, detaining general mechanics and bottom cleaning and remained working in the marinas at Nuevo Vallarta and Paradise Village, in Nuevo Vallarta.